There are the smallest e-cigs you’ll find (and the ones I’m most fond of). 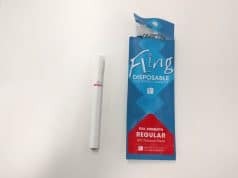 They make switching to vaping easy, because they mimic the shape and size of traditional cigarettes (also called “analogs”). 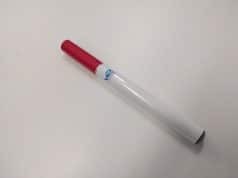 They are small, relatively lightweight (but all are heavier than cigarettes, since most of the size is dedicated to a battery) and relatively cheap to acquire. Cigalikes are also much more discreet, for those you prefer not to draw attention to themselves. Unfortunately, they usually come with trade-offs: they have small batteries, meaning you’ll need to recharge them often (or carry around a portable charging case). They’re often underpowered, producing barely sufficient vapor. And they tend to be costly in the long run, since you’ll need to replace cartridges/clearomizers often. Cartomizer-based models (such as the V2 Standard, VaporFi Express or the Halo G6) have small interchangeable cartridges consisting of polyfill wrapped around a heating coil. They’re extremely low-maintenance, but typically offer lower performance. However, their sheer simplicity and low price point will attract many first timers. Clearomizer-based models, like the V2 EX series and the Juul, have cleaner flavour and are very reliable. Unlike cartomizers, the clearomizers don’t need the polyfill. They give a fantastic vaping experience, but since they’re often not refillable it ends up to be more expensive in the long run. Some companies (like V2) do offer optional refillable clearomizers, but their design is less appealing than the non-refillable cartridges. Overall, mini e-cigarettes with clearomizers are fantastic and very low maintenance – as long as you can afford them! Tank-based products such as the eRoll-C have three separate pieces: the battery, the atomizer head and a small tank for e-liquid. These models have decent vapor production, but the atomizer heads can be relatively costly to replace. They’re also a bit fiddly, and you can easily get tired of the additional maintenance they require. As you can see, cigalikes are not perfect. I’m still looking for the perfect device, but a few of them come close – the Juul and the V2 Ex are my current favourites. Also knows as “Ego” models and “Vape pens”, they are a very popular option for people just starting up vaping. Unlike most cigalikes, these models have “manual” batteries – meaning you need to turn them on, and then press a button every time you want to take a drag. You get used to that fairly quickly, but it’s not nearly as natural as automatic batteries! Their batteries last much longer, and in general they are extremely reliable devices. These Ego devices are inexpensive to buy and inexpensive to use, because you can easily refill them with the e-liquid of your choice. Many devices in this category look the same – because they mostly are. You will see small differences in branding, price, customer service and the accessories on offer. My absolute favourite in this category would be the V2 Pro Series 3. It’s small, and unlike many other models it features a very original design with excellent build quality along with a very convenient magnetic charger. These devices are said to provide the absolute best vaping experience, at the expense of size and ease of use. They often enable extreme levels of customization, and I don’t talk about them a lot over here – they are for advanced users, and definitely not for those who want to replicate the feel of smoking cigarettes. 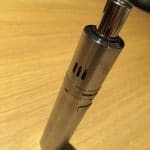 For those looking to upgrade from mini e-cigarettes, an Ego-style device is probably a better option! Most e-liquids share the same basic ingredients: a mixture of water, nicotine, flavoring, PG (propylene glycol) and VG (vegetable glycerin). You’ll see some variations on the theme, but that’s the bulk of it. PG is very thin and mildly irritant. This provides great throat hit, similar to what cigarettes feel like. It’s also much easier on atomizers – they’ll often last longer with a thinner liquid. On the other hand, it produces less vapor than VG. Some people might be sensitive to it – if that’s your case, you’ll want to switch to 70% or even 100% VG liquids. VG is thick, sweet, and produces great clouds of vapor. It’s also much easier on the throat – smokers used to light cigarettes might prefer e-liquid with more VG. 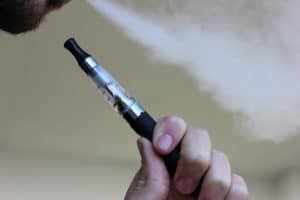 However, you will need to perform regular cleaning of your e-cigarette, since it favorises the build-up of gunk on the wick, coil and threads. A bottle of e-liquid with a “30/70” mix means 30% PG, 70% VG. If you’re just starting out, go with the most common ratio: 50/50 e-liquids offer a great balance for beginners. You’ll usually want to start high, and progressively lower the nicotine contents of your e-liquids. 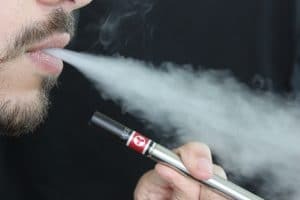 In order to figure out what will suit you best, I suggest you read Nicotine strength: how to choose your ideal e-liquid.